Way back in August 2011, I wrote about a CNN article that stated only 10-20% of people who play a videogame end up finishing it. Some of the industry experts interviewed stated that this metric was behind the rise of shorter campaigns, a heavier focus on DLC, and so on. After all, if it takes 100 developers a year and a half to produce six hours of gameplay, why would they spend even more time/money on extending that out when 80%+ of their customers aren’t going to see it anyway? Almost three years later, the completion rate has increased to about 30%. And the other 47.4% did not miss a single thing. There are caveats galore, of course. First, that series of infographics is damn ugly. Second, the research methodology is simply looking at Steam achievements, so it’s tough to say whether or not it’s representative of gamers as a whole (not that it’s claiming to be). I know Borderlands 2 was a part of a good Steam sale a few months back, but I’m pretty sure it didn’t end up on any bundle sites. In which case 24% of the people who own the game haven’t completed the very first quest, which is literally pressing E twice. Of course, when I ran my Steam ID through this website, it indicated that out of the 385 games I own, I haven’t played 63% of them. In my defense… err… uh… I buy a lot of Humble Bundle-esque sales. And Steam didn’t track stats for some of those games I did play a long while ago, like Half-Life and Counter-Strike. Incidentally, this is a major reason why I hate purchasing things at full MSRP. It is not really that $59.99 is some kind of insurmountable obstacle, but the reality for me is that I have enough games on Steam to last me until the heat death of the universe, and thus it’s difficult to justify purchasing more when I can reasonably wait for a price drop. And even when it’s something cheaper like Banished ($19.99) or Starbound ($14.99), it still doesn’t make a whole lot of sense to me; I can just work on the backlog and save a few bucks later. In any case, it’s heartening to know that the nightmare scenario of three years ago hasn’t occurred (yet? ), and that it appears as though the indie side of things can prop up a lot of the longer-game space AAA has vacated. 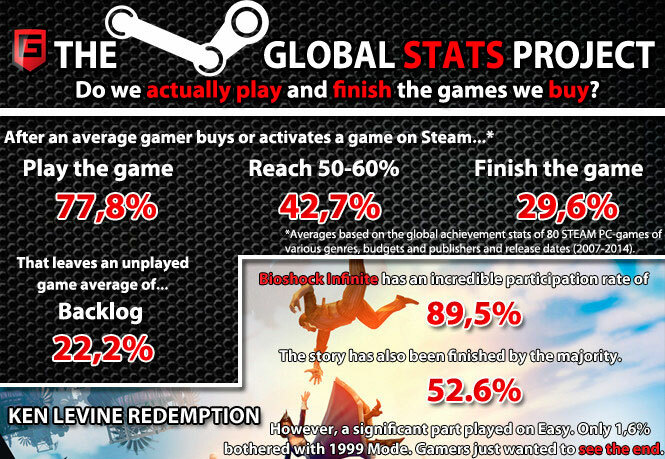 Still, as someone who endeavors to finish every game that I start even beyond the point of fun, this infographic is a sobering example that I might be well out of my mind.